For some, Anthony Bourdain gracing a restaurant is a good enough reason to eat there. For others that's a good enough reason to stay away. But for fans of sushi and Japanese cuisine, Sebo doesn't need a celebrity endorsement. Sure it probably doesn't hurt that the polarizing celebrity foodie ate the quaint Hayes Valley restaurant on national television and gave it a glowing review, but Sebo existed before Anthony Bourdain paid a visit. Located in a convenient strip of Hayes Street, close the freeway, public transportation and cafes, Sebo is more like eating in a friend's living room than going to a trendy sushi restaurant. Don't get us wrong, the restaurant is plenty trendy with it's traditional decor and its dim lighting but nothing about Sebo is overbearing, which you can't say about other hip sushi joints like Blowfish. It helps that Sebo is much smaller than Blowfish and that they don't have a large amount of beers on top and don't take reservations. Grab a seat on the bar and watch as fresh fish -- they have a no sushi menu on Sundays -- or sushi rolls are made before your eyes. Feel free to ask your chef a question or if you happen to be the odd non-fish eating vegetarian lost in a sushi restaurant, let them know and enjoy a special off the menu treat. 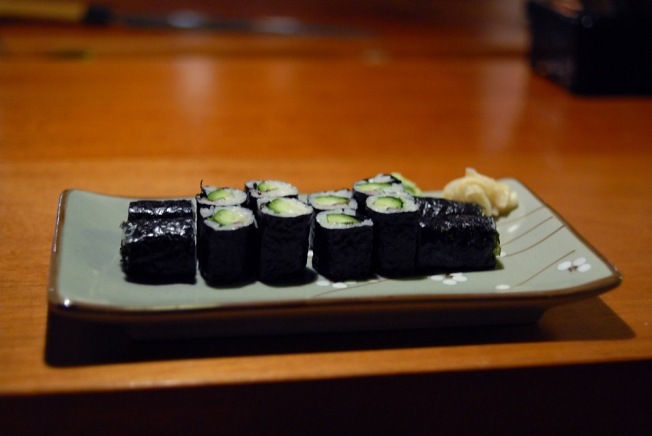 For traditional sushi purists, Sebo should hit the mark. The chefs import the majority of their fish from Japan. They even joked about it on Bourdain's show, asking the celeb chef not to tell the world that they aren't on Alice Waters' bandwagon. But the menu does change often to keep up with seasonal fish and what ingredients are available. If you can get over the guilt of how environmentally unfriendly your meal is, you might actually enjoy Sebo. And who wants to eat green fish anyway?